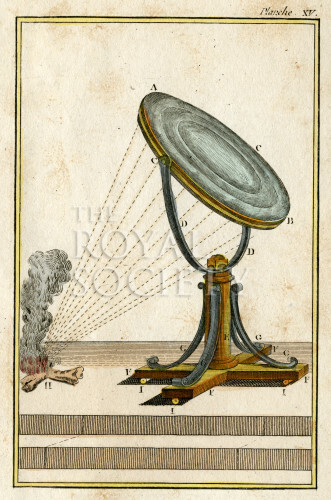 Study of the operation of a circular burning glass, or Archimedes’ mirror, constructed with a stepped lens. The lens is shown focussing sunlight to start a fire. Plate 15 from the book Histoire naturelle, généralle et particuliére…Nouvelle edition, by Georges-Louis Leclerc, Comte de Buffon and C.S. Sonnini, volume 5 (Paris 1799). The accompanying text describes the mechanism, sometimes known as a Fresnal lens, after its later development for lighthouse applications by the French civil engineer Augustin-Jean Fresnel (1788-1827). Georges-Louis Leclerc, Comte de Buffon (1707-1788), French naturalist and man of science, was elected a Fellow of the Royal Society in 1740. Charles-Nicolas-Sigisbert Sonnini de Manoncourt (1751-1812), French naturalist.